Oops - we don't appear to have a video for the P60. Plustek SmartPhoto P60 is a fantastic photo scanner for the elderly people or for those people who have absolutely no idea about the digital world. It is like switching your TV on - just press the button and your TV is on. Similarly, just press the button of the SmartPhoto P60 and your photo is scanned – as simple as this. 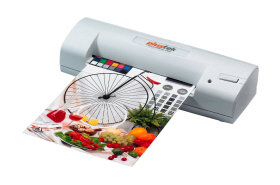 Its one button design makes it absolutely easy to scan the paper photographs and convert those into digital formats. There is no warm up time for the scanner. Secondly, there is again no software required. It uses the existing Microsoft windows photo sharing and viewing software. The user interface of the scanner is a small pop up window with only a little to choose from, which even a very little computer literate person can easily handle. On top of all these easy functionalities, the scanner uses your PC power to run. So, connect it to your PC or laptop through the USB interface and go on scanning as many snaps as possible. Only thing you need to remember is to check the continuous scan box of the user interface. The Palm size A6 photo scanner P60 turns your paper photos into digital JPEG format in minutes and saves those in a predefined location. Plustek SmartPhoto P60 helps our ecology by not allowing the paper photos to become multiple copies and shared among the friends or relatives, as it is sternly opposite to paper use. Secondly, it helps the photos to be kept organized in a repository for the future use. In cake of most of the paper photos, those become moth-eaten, discolored or even dog eared, if kept on the display box or hung from the walls. Even, in some cases, the owners of the photographs forget the photographs and their locations. On the other hand, P60 can actually make all the photo-preservation organized. As and when you require any photo, just key in the index on the search engine, the photograph can be out for your use. Not only preserving photographs is easy, but also in seconds, you can upload your digital photos onto your web photo-album then and there only. You can scan the photographs in a predefined resolution, size, color and format so that you can use it for Facebook, Orkut, MSN, Flickr, etc. Secondly, before any important event of your friends and relatives life including marriage and birthdays, you can actually surprise them with the age old photographs, which they might have forgotten. Today, digital photo frames are available at a very cheaper cost. These photo frames are not only digital photo albums but your daily calendars, alarm clocks and many more. Using P60, you can scan all of your photographs and upload the entire photograph onto the digital photo frame and program the photo frame in such a manner that it can keep on changing the photographs in every alternative minute or second keeping you memory very fresh. You can also load songs onto the photo frames suitable to the occasion of the photographs and enjoy the good old days while at home or at office also.